It’s official! A survey conducted by Pew Research Center, has found that Obama was the greatest president in our lifetime. When asked which President had done the best to help out America, a total of 44 percent of those surveyed said Barack Obama had done the best job during his term. This compared with about one-third, who mention Bill Clinton with a 33 percent, and Ronald Reagan with a 32 perfect. Not yet halfway through his term, 19 percent of Americans stated current President of the United States, Donald Trump, has done the best job as U.S President. Could it be that Americans like to wait until the President’s term is over to rate their time at the White House? Well, in 2011, the same survey was conducted, where 20 percent viewed Obama as the best president. The survey was conducted this year from June 5-12 among 2,002 adults by telephone interviews. These individuals were adults, 18 years or older, living in all 50 U.S. States and the District of Columbia. Individuals were asked open-ended formatted questions, in regards to which president has done the best job in their lifetime. The analysis was based on their first and second choice. Around one in ten adults, 12 percent, said John F. Kennedy did the best job in office during his lifetime. Kennedy was actually named as the best to second best president by a quarter of those who were alive during his Presidency. Baby Boomers were at a 24 perfect, while 25 percent were those in the Silent Generation. It’s safe to say these percent are varying, due to the separate generation gaps. 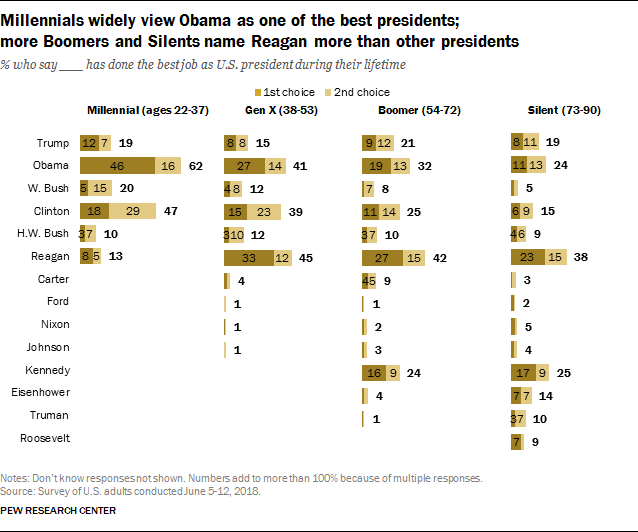 Sixty-two percent of millennials, ages 22 to 27, named Obama as their first choice, while for Generation X, ages 38 to 53, were split, naming Reagan (45 percent) as first, Obama (41 percent) as second, and Clinton (39 percent) as third. As was the case in 2011, many, including the President’s party, do not name their current president as the best in the lifetime. Back then, 39 percent said Clinton had been the top choice, compared to Reagan who got 34 percent and Obama who reached a 20 percent. To date, Obama’s numbers more than doubled since 2011, from 20 percent to 44 percent, while Clinton declined from 49 percent to 33 percent. Along partisan lines, it’s no surprise most Americans choose their President due to their preferred party. 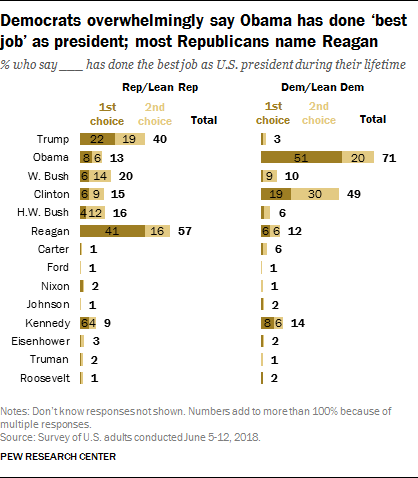 Among Republicans and Pre-Republicans leaning Independents, 57 percent landed towards Ronald Reagan as their first or second choice, followed by Donald Trump at 40 percent. 20 percent named George W. Bush as their number one choice, 15 percent named George H.W. Bush, and 15 mentioned Clinton as their number one choice. Among Democrats and Democratic-leaning Independents, 71 percent say Barack Obama was the best President in their lifetime. 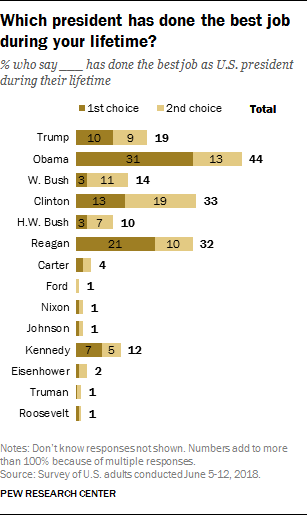 About half of Democrats, 49 percent, named Clinton as their first choice, 12 named Kennedy as one their top two, 12 named Reagan and 10 named George W. Bush as their favorite. In 2011, Clinton was named most often as best or second best president by 69 percent of Democrats, while Obama had 32 percent.